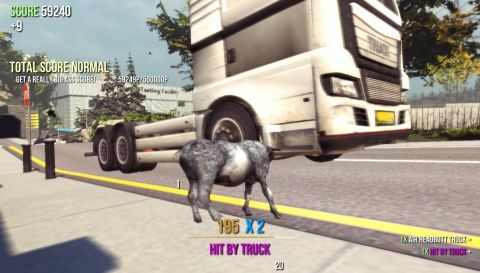 If Goat Simulator really was a goat simulator, you'd spend the whole game padding around a field eating grass and occasionally being milked, before ending up on a plate in some upmarket restaurant. But that would make for a rubbish game, so Coffee Stain Studios, the Swedish team behind the Sanctum series, have used artistic licence. Instead, you crash around a physics-enabled world knocking things over, headbutting people, dragging stuff around with your tongue, and generally being a pain in arse for points. Think Tony Hawk's Pro Skater, but with a goat. I timed it, and it took me 23 minutes to get bored. The single map is tiny, and although loaded with stuff to mess around with, interaction is limited. You can headbutt things, or kick them with your hind legs if you hold back while attacking. You can lick things with your tongue, which acts a bit like a bendier version of Just Cause's tether cable. And you can jump and spin around in the air. That's pretty much it, and by combining these actions you score points and rack up combos. Destroying things in quick succession, staying in the air for extended periods of time, and other goat-based mischief sends your score ticking up, as do other more specific actions. Terrorise a group of people having a barbecue in a backyard and you get the 'party crasher' bonus. Crush a car with a giant boulder and you get 'dodge this'. Charge through Coffee Stain's office and you earn a 'goat among legends' bonus. Discovering these is where I had the most fun with the game, but the limited map size means you'll probably uncover all the secrets and Easter eggs in an hour. Like Octodad, Goat Simulator is a joke stretched way too thin. Humour is subjective, of course. You might chuckle yourself unconscious when you play it, but I didn't laugh at all. Not even a sharp exhalation through the nose. There was a time when ragdoll physics was funny, but the novelty has worn off for me. It's the perfect word-of-mouth game, though, which explains its absurd success. You'll watch someone sniggering at it on YouTube and you'll want to buy it to be in on the joke. But beyond the eye-catching premise, it's just a bad, amateurish and boring game. The developers know this. "You should probably spend your money on something else," they advise, wisely. But no one cares, do they? As I type this, it's the best-selling game on Steam. Because look at the funny goat! Haha! It's doing absurd things not normally attributed to a goat! Haha! And it's got ragdoll physics in it! Haha! Look at the goat! The funny goat! Hahahaha!